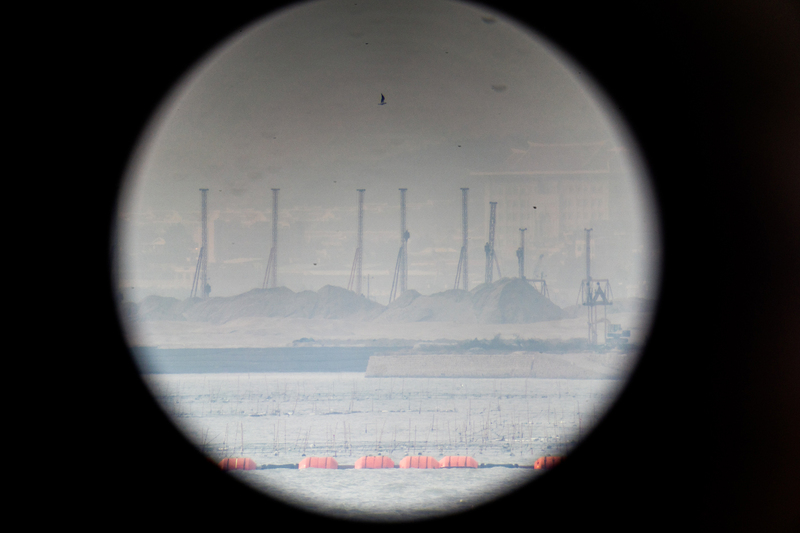 Viewed through binoculars from the Mashan Observation Station on Kinmen, pile drivers rise above sand dunes on China’s Dadeng Island, the closest point in mainland China to Kinmen, and the proposed site of nearby Xiamen’s new airport. 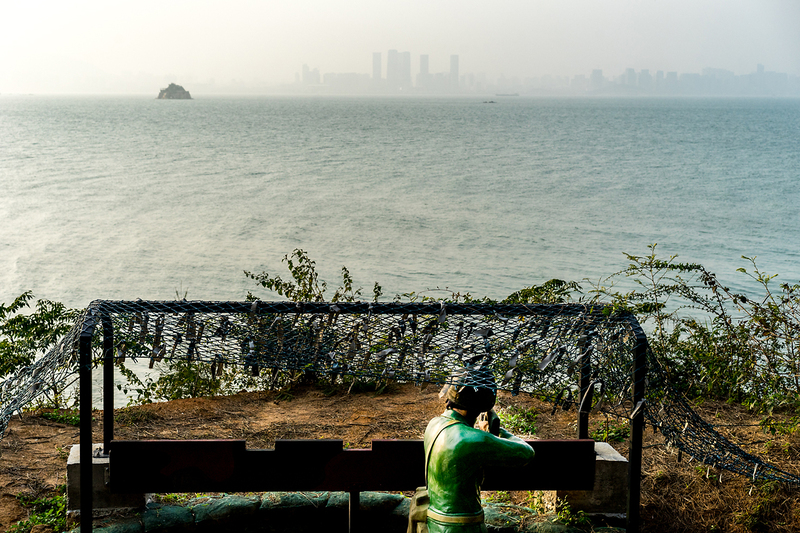 A statue of a soldier faces the waters beyond Lieyu Island, also known as Little Kinmen, a short ferry ride from Kinmen proper. This island is a tourist stop for visitors interested in the military history of the region, where young Taiwanese soldiers used to deploy along Kinmen’s coast to watch for enemy ‘frogmen’ from China. 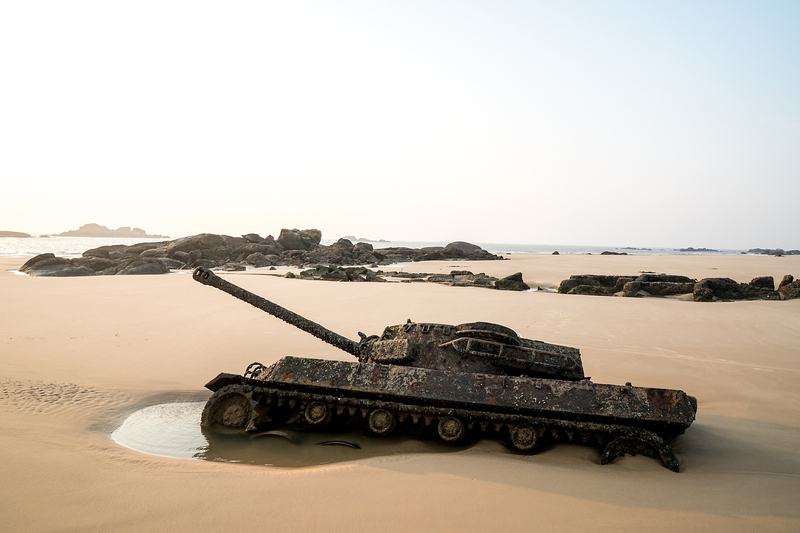 A military tank, half buried in the sand on a beach, is visible at low tide in Kinmen. The island was managed as a military base from 1949 until 1992, when martial law was lifted. KMT leader Chiang Kai-shek stationed a significant portion of his army on Kinmen, planning to retake mainland China from there. At the height of the Cold War, as many as 100,000 soldiers were barracked on Kinmen, outnumbering civilians. Today, there are only about 3,000 troops left on the island. 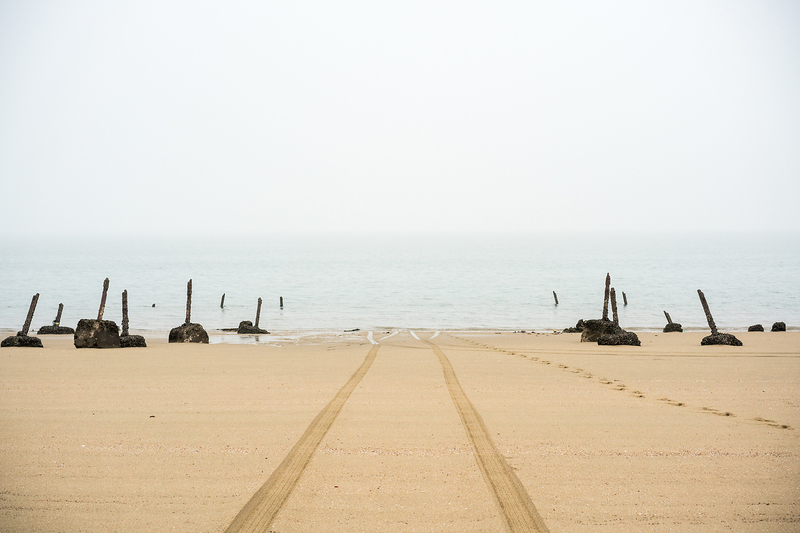 This stretch of beach at Guningtou, in northwest Kinmen, was the site of bloody fighting in October 1949 when troops from the People’s Liberation Army (PLA) landed to retake the island from the Nationalists. They lost massively, leaving Kinmen in Guomindang (KMT) hands. For decades, Kinmen would serve as a frontline against Communist China, a history these rows of spikes recall. 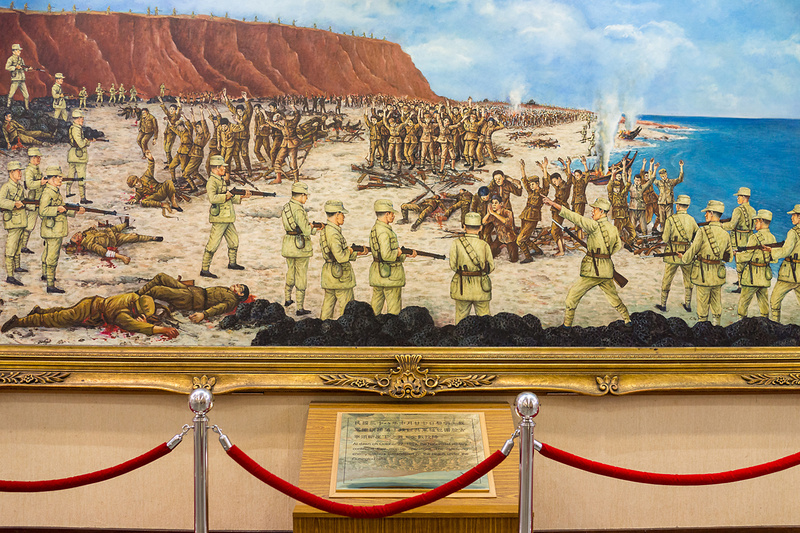 At the Guningtou War Museum near the site of the decisive battle of October 1949, paintings depict scenes from the bloody fight over Kinmen during the Chinese Civil War. The Communists’ attempt to take Kinmen and Matsu in the Taiwan Strait as a precursor to a planned assault on Taiwan failed when the tide changed, stranding the Communist soldiers on Kinmen and forcing them to surrender. Some 6,000 PLA soldiers were captured and remained on Kinmen to be ‘reeducated’ by the Nationalist government. 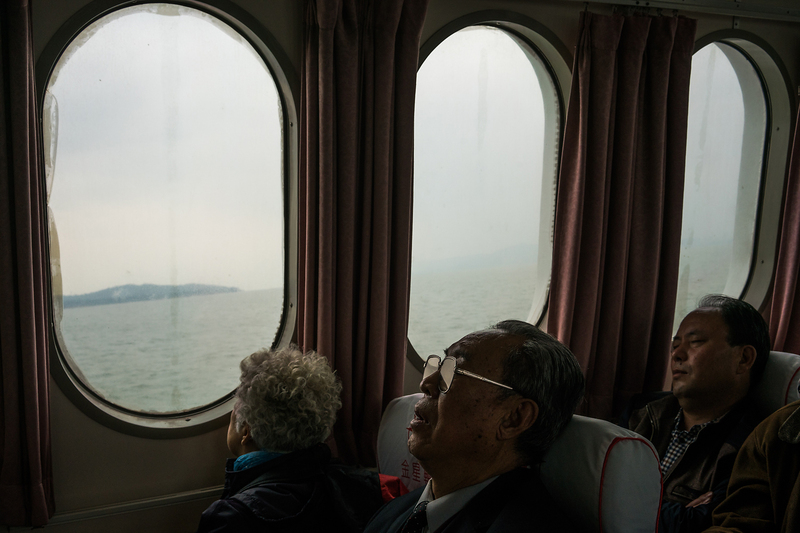 On the 30-minute ferry ride from Xiamen’s Wutong ferry terminal to Kinmen, an elderly mainland Chinese tourist takes a nap while his female companion looks out the window as the boat crosses from Chinese to Taiwanese territory in the Taiwan Strait. The ferries were launched as part of the ‘Mini-Three-Links’ between China and Taiwan in 2001. More than 1.5 million passengers traveled by ferry in 2014 between Fujian, in China, and Kinmen. Since 2015, Chinese tourists traveling to Kinmen can easily get visas on arrival, a move to encourage mainland Chinese tourism. 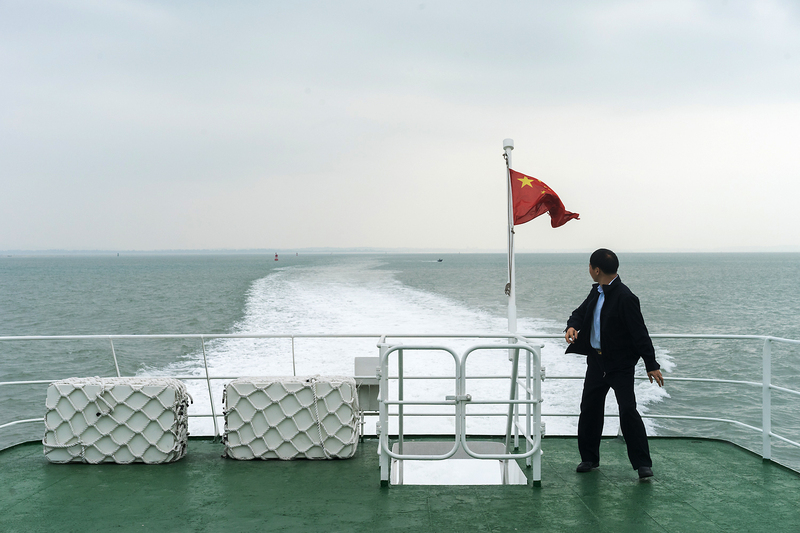 The Chinese flag flies from the stern of a Xiamen-run ferry passing through Chinese waters on a return trip from Kinmen. The ferries that ply the Taiwan Strait are run alternately by Xiamen and Kinmen ships. Although China does not officially recognize Taiwan, and continues to see it as a renegade province, there is an unwritten understanding between the ferry companies on both sides. The Chinese and Taiwanese flags are lowered at the midway point and flown again only when the ships are back in their respective territories. 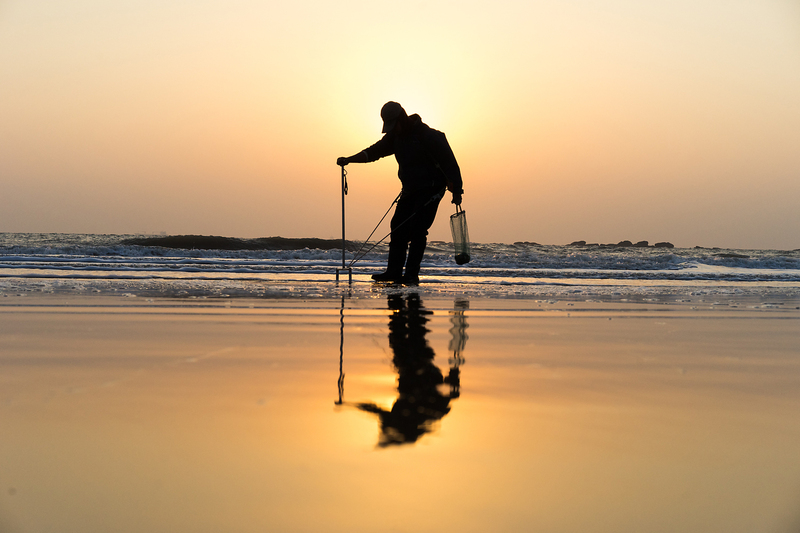 A villager on Kinmen’s southwestern coast combs the beach at sunrise as the tide recedes. It was only in 2013 that Kinmen was declared free of mines. Tens of thousands of mines were planted in the ’50s and ’60s at the height of tension between Taiwan and the People’s Republic of China. The island was ruled as a military base until 1992 and was subjected to ‘frogman’ attacks and regular Chinese shelling. The mine-laden beaches and military rules restricting locals from swimming or going near coastal areas where the army was stationed have left Kinmen residents with a complex feeling towards the sea. Many residents cannot swim and still have a fear of the water for all the negative imagery it conjures. 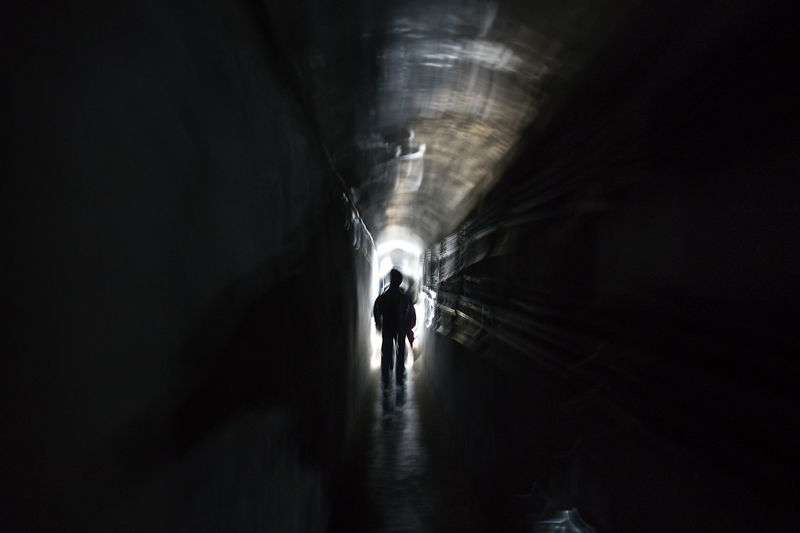 Under the constant threat of war and regular shelling from China, the Taiwanese military constructed extensive networks of tunnels beneath Kinmen and Little Kinmen to provide shelter as well as supply routes for its military vehicles and ships. This one, the Kinmen Civil Defense Tunnel, which runs beneath the present-day main bus station, Jincheng, is more than a mile and a half long and takes at least 30 minutes to pass through. 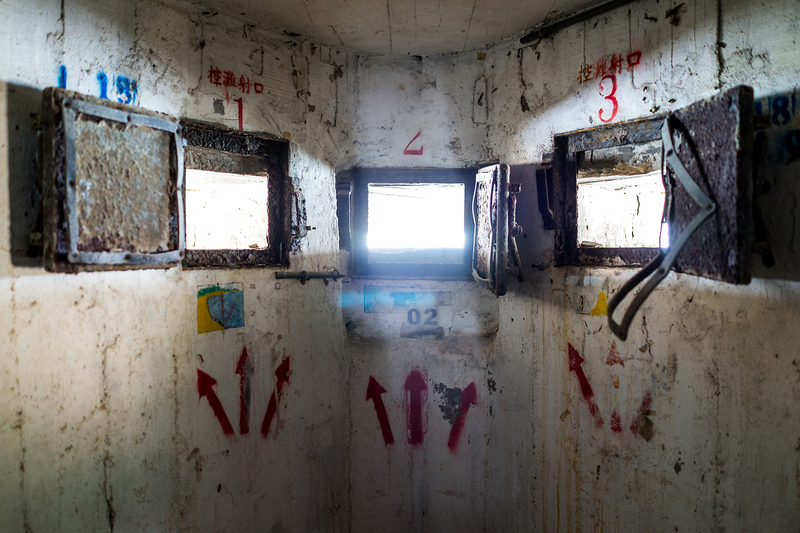 Windows in the coastal L18 military bunker and fort on Lieyu Island, through which soldiers would have watched the coast and fired their rifles, show the signs of age and disuse. This place is at the heart of a dispute between civil society activists and local authorities who have drawn up plans to redevelop the location into a tourist spot celebrating Little Kinmen’s specialty product, the yam. Local activists say redeveloping the bunker would destroy its authenticity and grit. 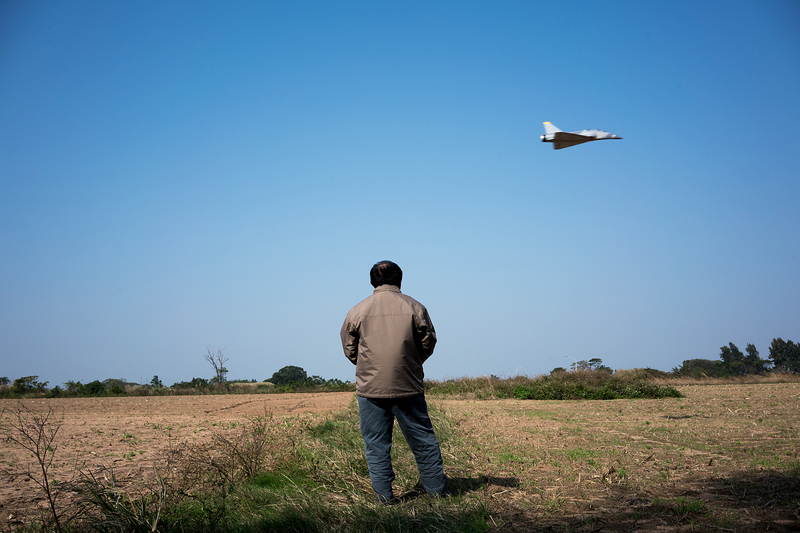 Activists and local military historians have been researching the military installations littered all over Kinmen and have, with some success, protested several government plans to develop areas for tourism, on grounds that it would destroy historical heritage, wildlife, or the environment. A Chinese saying describes the relationship between Taiwan and China as, ‘as close as lips and teeth.’ But younger Taiwanese are increasingly uncomfortable with this formulation. The KMT’s Ma Ying-jeou, with his closer ties to China marked by a historic meeting with Xi Jinping in Singapore in 2015, became deeply unpopular during his time in office. The last elections, on January 16, 2016, brought the Democratic Progressive Party’s Tsai Ing-wen, a Beijing-skeptic, into office with a landslide victory. However, Kinmen remains a KMT stronghold and seeks closer ties with China. 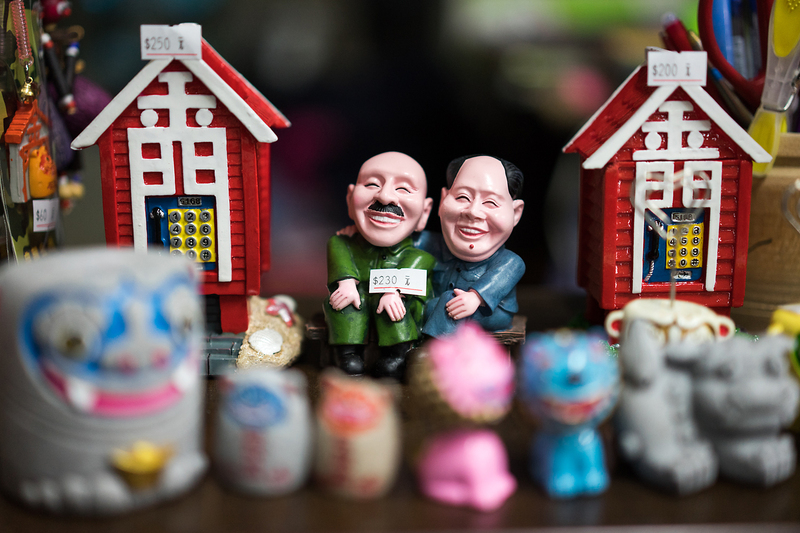 A souvenir in a shop in Little Kinmen humorously depicts Chiang Kai-shek and Mao Zedong sitting together, Mao’s arm around Chiang. The two leaders led their respective sides through a bloody civil war, culminating in the battle over Kinmen in October 1949. 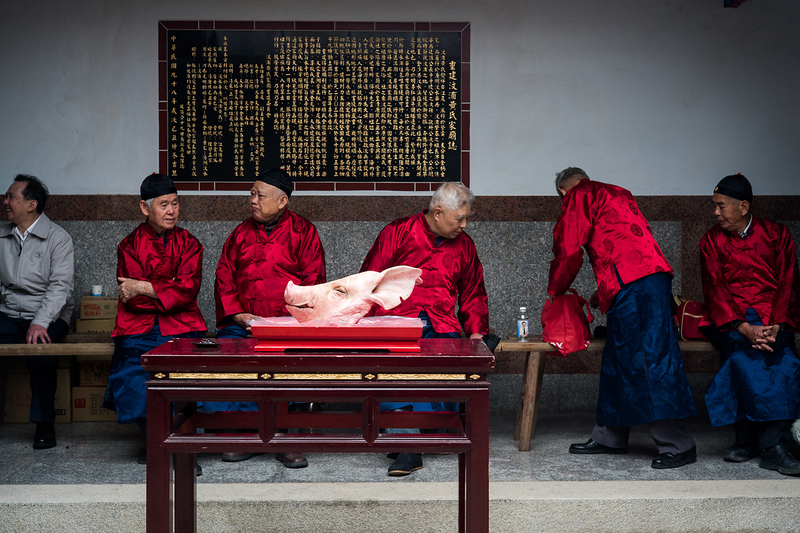 Villagers in traditional dress remember their ancestors in a ceremony where a pig’s head is used as one of the main offerings. While some parts of China have kept old folk religious traditions despite the Cultural Revolution and the restrictions imposed by the officially-atheist Communist Party government, it is widely held that Taiwan (and some Chinese communities in Southeast Asia) have better preserved those traditions. Religion provides another important link for Kinmen residents to mainland China. Many of the temples on Kinmen are branches of temples in Fujian province. A tour group gathers its luggage from a bus at Shuitou Ferry Terminal in Kinmen, preparing to catch a ferry to Xiamen. 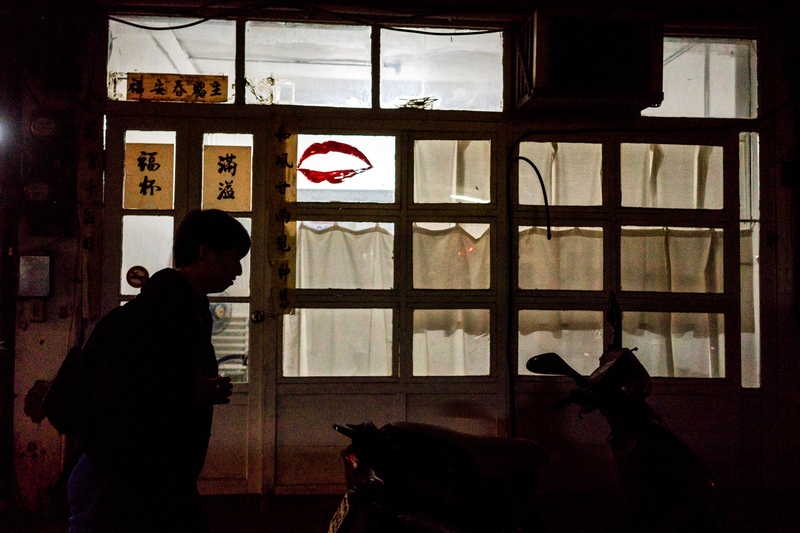 In the years following the end of military rule in Kinmen, the local government and residents have tried to draw more tourists from China—their one-time enemy. More than 750,000 tourists visited the islands in 2014, more than five times the local population of about 128,000. Tourists from mainland China accounted for nearly a third, up 41 percent from the previous year. 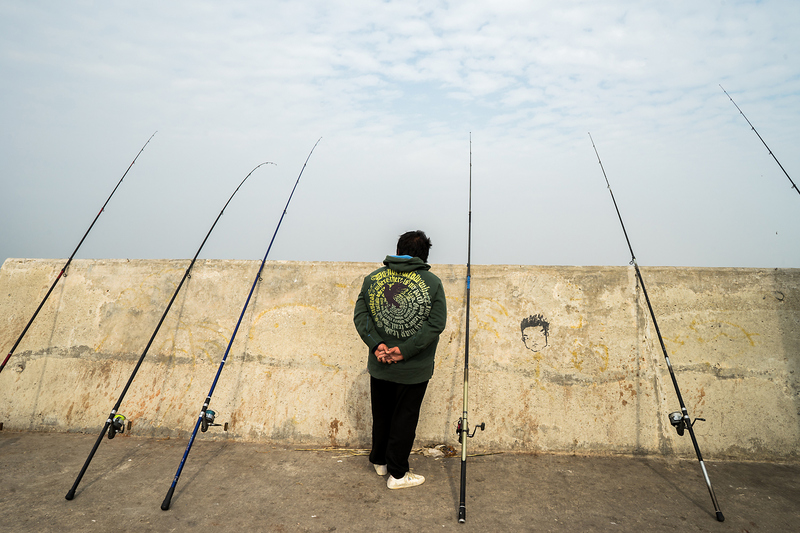 An angler waits for a bite at an embankment near the Shuitou ferry terminal. The embankment was built alongside the ferry terminal and lighthouses on reclaimed land and part of what was formerly a fishing village. Some local residents from the village protested the development, which made them lose their natural port and fishing livelihood and also harmed the habitat of the horseshoe crab. In the former fishing village of Houfenggang, the reclamation of land and development of an embankment and new port swept away the natural port and with it the livelihoods of the fishermen. 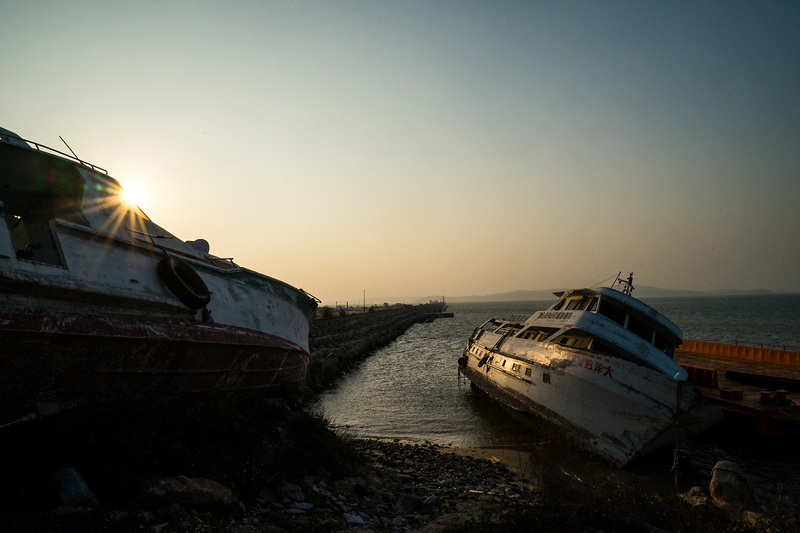 Some of their ships and boats are left rotting, disused, near the new concrete embankment. Development by the government—with one eye on attracting ever more mainland Chinese tourists—has emerged as the key issue Kinmen’s burgeoning civil society activism centers on. 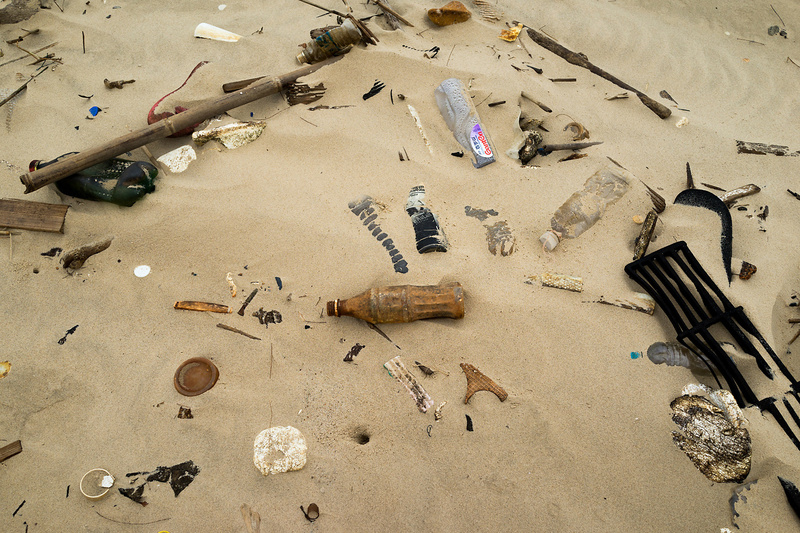 Ask Kinmen residents what they feel about Xiamen and mainland Chinese and they might first point out that rubbish is floating over from them to Kinmen’s shores—complete with their simplified Chinese labels (in contrast to Taiwan’s traditional Chinese). Smog blows over, as well, blanketing Kinmen. This essay is part of China Borderlands, ChinaFile’s new project to document life on China’s borders, in partnership with the VII Photo Agency. Sim Chi Yin produced this essay as a ChinaFile Fellow. Mounds of sand sit beneath a row of pile drivers on Dadeng Island, where the Chinese city of Xiamen is building a new airport on reclaimed land. Syril Hung sighs, awe-struck by this scene. The retired editor is looking through a pair of binoculars from the Mashan Observation Station on Kinmen, a nearby island that belongs to Taiwan. On a clear day like this, we can see sand-dredging barges working non-stop in the two-kilometer stretch of open water that separates the two former Cold War rivals. For decades, Kinmen has grappled with being the part of Taiwan closest to mainland China; nearer than it is to Taiwan, the island that has been self-governing since the end of World War II but which Beijing regards as its own. Kinmen is a 30-minute ferry ride from China, but an hour’s flight from the Taiwanese capital of Taipei. Kinmen, all of 153 square kilometers, bore the brunt of bloody battles in October 1949 when the Nationalist Guomindang (KMT) soldiers based in Taiwan beat back the Communist People’s Liberation Army, keeping the island in KMT hands. In the years that followed, Kinmen was a military base where the Taiwanese leader Chiang Kai-shek stationed much of his army to prepare to retake the mainland. The island, which is also known as Quemoy, suffered numerous small incursions, 20 years of shelling by China, and decades of direct military rule (1949-1992) from Taiwan. During a six-week artillery barrage in 1958, 500,000 rounds of mortar rained down on its tiny landmass. At the height of the Cold War, it was seen as a frontline to hold. The United States moved its warships into the Taiwan Strait in 1950 to prevent the Communists on the mainland from launching an invasion. Over the past decade, however, relations have relaxed, with ferry services plying the narrow strip of water between Kinmen and Xiamen every half hour, and there is a constant flow of people and trade in both directions. In an unspoken arrangement to keep those waters calm, ferries from each side lower their flags when they reach the halfway mark. Other residents yearn for more Chinese tourists, investment, and the completion of a long-discussed bridge linking Kinmen directly to China. Locals and politicians speak of the great “sacrifices” Kinmen and its people have had to endure because of its role as the frontline, missing out on the decades of rapid development that much of the rest of Taiwan experienced. Kinmen has remained an economic backwater, with low-rise buildings and quaint old streets keeping it in a sort of time warp. Although seemingly remote and marginal in Taiwanese politics, Kinmen’s important place in cross-strait relations saw then-outgoing President Ma Ying-jeou and recently-elected President Tsai Ing-wen make it a key stop during their campaigns ahead of Taiwan’s elections in January 2016. 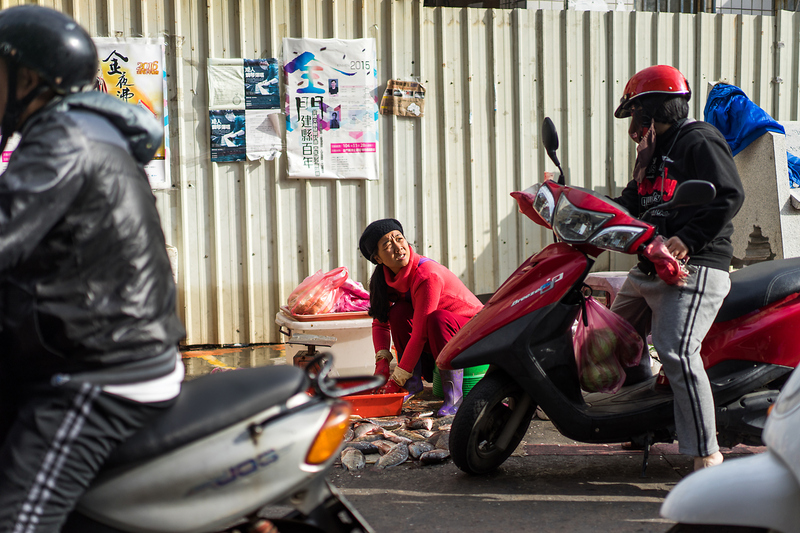 Originally from the same Fujianese ancestry as mainland Chinese across the strait, Kinmen islanders, for the most part, are less Beijing-skeptic than people on the Taiwanese mainland 100 miles away. But Kinmen locals see the looming presence of China on their shores, and even under the recently elected pro-independence Democratic Progressive Party government, there is little to hold back ever-closer ties between the two sides. Kinmen has evolved from being a military frontline to, in recent years, the test site for many cross-strait political experiments. It is where China-Taiwan postal and transportation connections were first offered and now there’s an annual swim across the Taiwan Strait over which bombs were once lobbed. Kinmen is also due to get water piped from China’s Fujian province soon. But the traces of history and military tension are never far from the surface in Kinmen. Beneath the island is an intricate maze of tunnels blasted open for villagers to hide in during air raids, some dug large enough for supply boats. 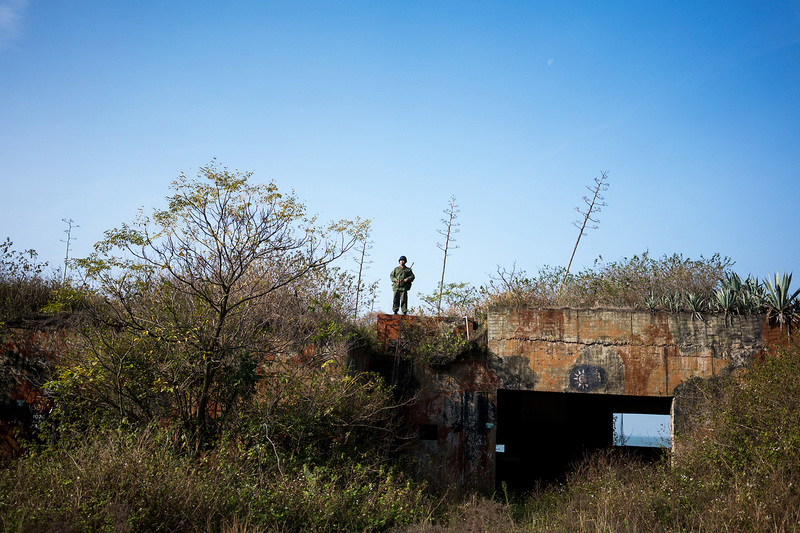 Although the presence of Taiwanese soldiers has dropped from 100,000 at its peak in the 1950s to just 3,000 now, old military vehicles, bunkers, forts, and shells litter the island, evoking a time and tension past. 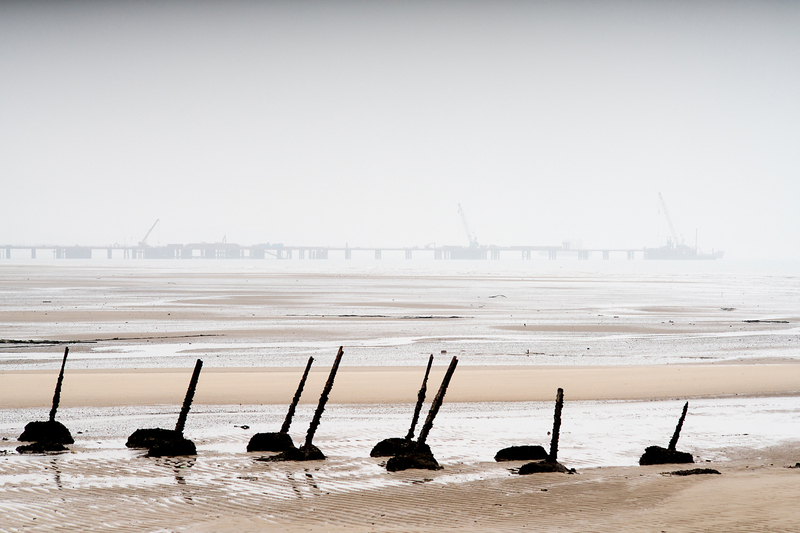 At low tide on the northwest coast where some of the worst battles took place in 1949, row upon row of barnacle-covered iron spikes pierce the sand, placed there to deter the “water ghost” commandos sent from China to conduct sabotage at the height of cross-strait tension. But whether at low or high tide, just beyond the horizon, Xiamen’s spectacular growing skyline is in clear sight. As a fishermen tugs at his nets to check on his catch early one morning, a powerful ferry speeds past behind him, heading towards the shimmering skyscrapers on the other side.